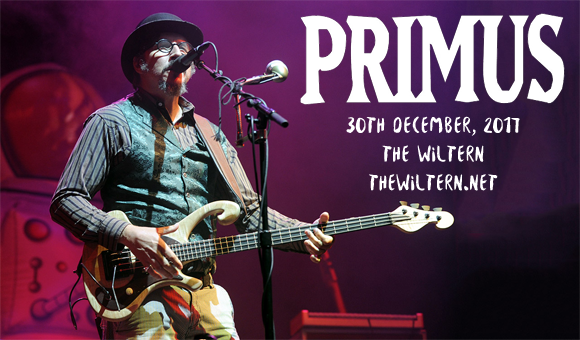 What a way to round off the year – Primus are coming to The Wiltern on Saturday 30th December 2017 to rock your socks off for the second night in a row! Embarking on the Ambushing the Storm Tour which promotes their new album The Desaturating Seven, the band will bringing fresh new tracks, as well as the classic craziness we all know and love! Formed in El Sobrante, California in 1984, funk rock band Primus currently consists of bassist/vocalist Les Claypool, guitarist Larry "Ler" LaLonde (both formerly of thrash metal band Blind Illusion) and drummer Tim "Herb" Alexander. To date, the band has released eight studio albums to date; an eclectic mix of bass-driven, complex and unusual records, earning them the reputation for being “… quite possibly the strangest top-10 band ever!” Also known for recording the original theme for the TV show South Park, the band's most recent release, 2014's Primus & the Chocolate Factory with the Fungi Ensemble, is a re-imagining of the soundtrack to the 1971 film Willy Wonka & the Chocolate Factory.